Hawkins Coffee’s wide range is selected from the finest pure coffees from Central America, Africa and the Far East, all the coffee is roasted on site in Budleigh Salterton, Devon and only Arabica beans are used. 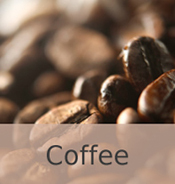 All our coffee can be supplied freshly ground for, expresso, cafetiere, filter or perculator. Choose Mackgills as your one stop coffee bean shop. More emphasis on the Colombian without the continental. This is a morning coffee, a blend of three of the highest quality coffees, which complement each other.. This is a traditional blend of Mysore from the Coorg region of India and Ethiopian Mocha. A smooth coffee with a hint of the `gamey´ flavour of the Mocha. A blend of coffees taken to a high roast, the beans are oily black, and full of continental flavour, by itself very strong. Ideal for home blending, add 10% to your Colombian or Kenyan. Light fruity coffee with a lower acidity than many Kenyan beans. A mild tasting coffee with the characteristic Colombian `nutty flavour´. Ideal for all day use.